Combine up to 10x faster print speeds and 3.7x larger build volume than similar class printers with rapid single lane printing for high productivity of 100% wax precision metal casting patterns with an affordable 3D printer. 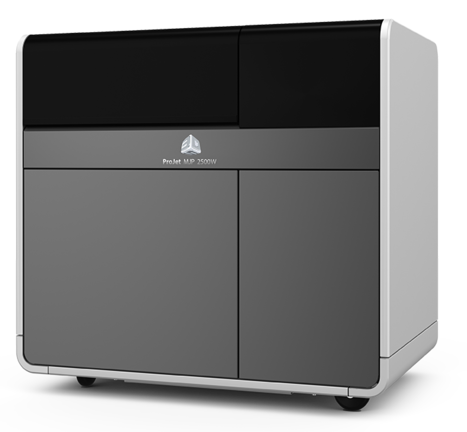 The new ProJet MJP 2500W is an affordable 100% RealWax pattern 3D printer that adjusts to your workflow, delivering from several short run batches a day to next day typical larger builds at high productivity. These highly accurate, fine wax patterns are directly printed, without tooling time, costs and geometric limitations, for reliable and repeatable direct metal casting efficiency. The VisiJet M2 CAST 100% wax material melts like standard casting waxes, with negligible ash content in casting. This material is durable for handling and casting fine features, and the high contrast purple color allows for better detail visualization. Featuring fast wax patterns production, at up to 10X faster print speed than similar class solutions, and even faster workflow with single lane builds, the ProJet MJP 2500W improves the casting room efficiency. With a 3.7X larger build volume capability than similar class printers for broader applications versatility and 24/7 operation, this affordable printer’s high productivity means fast amortization and high return on investment. Consistently print sharp edges, extreme crisp details and smooth surfaces with high fidelity, ideal for intricate precision metal parts manufacturing with reduced metal hand polishing.